Where is the Maspero Youth Union Now? Twenty-three Egyptian liberal activists were sentenced to three years in prison for demonstrating against the protest law on Sunday. Amid the ongoing clampdown on dissent, the common observer can sigh, but be forgiven for asking: Whatever happened to those Coptic youth activists? Did that massacre at Maspero all but end their influence? Or like most Copts do they support the current regime and its policies? 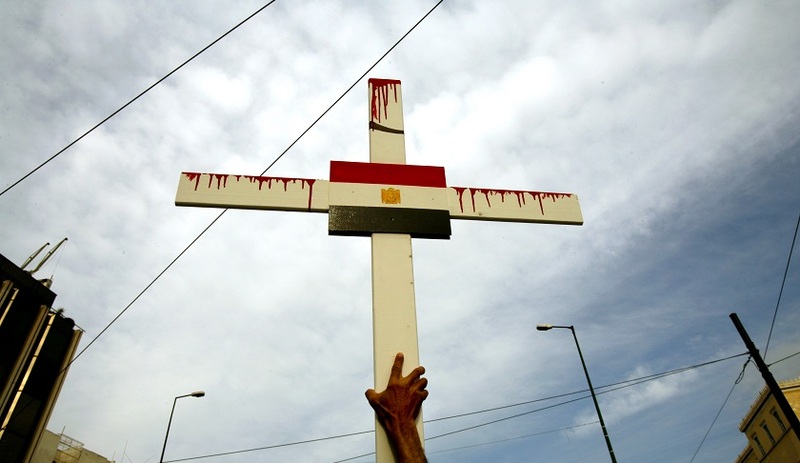 On October 9, 2011, twenty-seven Coptic Christians were killed during a protest against ongoing attacks on churches, the majority underneath the wheels of military vehicles, which plowed through their demonstration. The Maspero Youth Union, born in the spring of that year, was the most vocal and organized of an emerging Coptic activism that was considerably quieter thereafter. Close observers of Egyptian politics will recall hearing their name here and there amid the tumults of the revolutionary struggle. They most recently appeared in a small candlelight vigil, commemorating the three year anniversary of the Maspero massacre and calling for justice against former top military brass. But it is not true they have been silent, insisted Mina Magdy, general coordinator of the MYU. They have issued statements to the media, mobilized for elections without endorsing a candidate, and participated in government-sponsored youth outreach. They appeared before the constitutional committee to advocate for favorable clauses and communicated with thousands of Copts through social media. Andrawus Ewida, head of the committee responsible for MYU work in the governorates, went further. MYU activists, he explained, were a prominent contributing force behind the Tamarrod protests against then-President Mohamed Morsi. But this mobilization was not advertised out of fear that their participation would allow labeling it as a Coptic movement. Affiliated members also carried out documentation of the subsequent August 14 attacks on churches across the nation, he said. But even granting their continuing activity, the question is fair: What influence do they maintain on the Coptic street? What relevance do they have in the political process? For many Coptic observers, the answer is nil. Ishak Ibrahim, a researcher with the Egyptian Initiative for Personal Rights, lauded the MYU for its role in mobilizing Copts into the political process through their protests. But after June 30, he said, the power and place of demonstrations has declined, and the MYU has not evolved sufficiently into a viable organization. Youssef Sidhom, editor-in-chief of the Coptic newspaper Watani, agreed. He finds them genuine and positive in demanding justice for the incident of the Maspero massacre. But their composition as a religious-identity based group is not helping the Coptic cause, which is best addressed under Muslim leadership with great intermixing. And in the chief issue of the day—the shaping of liberal alliances in the coming parliamentary elections—the MYU has been absent, he finds. Save for assertions of their influence among Coptic youth, the MYU largely agrees with these critiques. But the group is currently in a period of reorganization to set themselves right. On October 17, Magdy won internal MYU elections against a challenge from Ewida, for a one year renewal of his position as general coordinator. He is tasked with reformulating the statutes and bylaws, while parsing the membership list and defining its criteria. He hopes to officially register the MYU with the government, and prepare for formal election of the group’s political office and six other standing committees. Magdy realizes the MYU is not well connected to political or revolutionary groups, though he forswears participation with the April 6 Movement or the Revolutionary Socialists, due to their ongoing issues with the regime. However, he lends the MYU’s voice to calls to rescind the protest law and free imprisoned activists who protested against it. Ewida adds there is not enough transparency to distinguish between regular protestors and the terrorists of the Muslim Brotherhood. Indeed, the two candidates for leadership of the MYU had similar perspectives on almost all matters, administrative and political. Besides their stance on the protest law, they argue for full freedom of expression and the regular litany of Coptic issues: building and rebuilding churches and a law against discrimination. Rather boldly, they also advocate rescinding the blasphemy law and regulating conversion both to and from Islam. They insist they do not want to be a sectarian organization, but rather a pressure group on any government. But even within the election are signs they have a long way to go. Early on during the height of their street demonstrations, the MYU claimed 10,000 members. Now they measure their active members in the hundreds. Only those most active were given the right to vote—twenty-three. This number included six representatives from the governorates, where MYU representatives operate in Alexandria, Port Said, Suez, and Ismailia. But Ewida contested the election vote, saying procedural issues prevented six others from casting ballots and that members in other governorates were not sufficiently recognized. The official tally was 16-6 for Magdy (with one unable to vote), and the MYU legal committee ruled against Ewida’s appeal. Ewida described his candidacy, though, as an exercise in educational democracy. He did not plan to win, but wished to have the group experience a true election and witness an opposition. He hopes the results push Magdy to recognize minority questioning of his leadership, to seek group consensus for his decisions, and to be held accountable for efficient MYU reorganization. For his part, Magdy is eager to see the elections demonstrate something more—a Coptic political group experiencing a peaceful election cycle. This experience, he hopes, will compare positively with so many other post-January 25 entities which have suffered splits and divisions. Perhaps this, above all, is what may win the Maspero Youth Union relevance. Now it is up to Magdy, Ewida, and their activist colleagues to demonstrate the utility of a democratic order. This article was originally published at Egypt Source. « Who Will Run Egypt’s Parliament?